← If a film falls in the forest, and there’s no one around to watch it, does it even matter? I just recently watched a featured documentary through the NFB website about Ryan Larkin, a 1960s and 70s animator who for a short time worked alongside Norman MacLaren (our Canadian claim to animation fame) before succumbing to a cocaine addiction and leaving only to end up begging on the streets of Montreal. I know what you’re thinking, and no, it wasn’t Chris Landreth’s Oscar-winning animated documentary Ryan. It is Laurence Green’s 2004 film Alter Egos, which sensitively explores the relationship between Landreth himself and his subject; between one animator who rises to fame through depicting another’s failure. The story is sad, romantic, surreal. 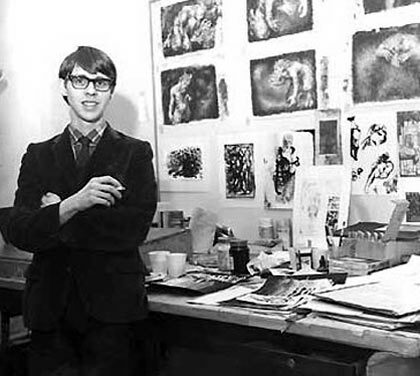 Ryan, a young and promising animator, gets a job working under Norman MacLaren and others at the NFB in the 1960s. He is prolific, churning out highly-sophisticated animated shorts. 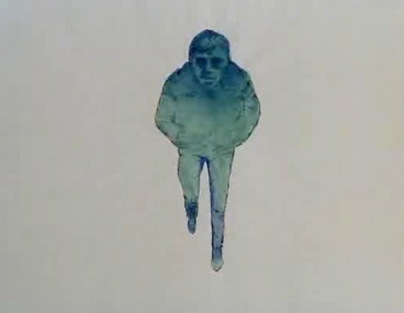 He eventually receives an Oscar nomination for his 1969 short Walking. He made significant creative contributions to a number of other well-received animated films (including Running Time and Street Music) up until the mid 1970s. Green’s film implies,however, that Larkin’s subsequent financial success funded, at least in part, an escalating drug addiction — one that would eventually put a halt to his creative production altogether. Enter Chris Landreth, a young, up-and-coming animator who decides to pull Ryan’s story from the vault — oh, and win an Oscar in the process. Landreth’s 14 minute animated interview with Larkin tells the story of a broken man whose place in Canadian history floats ambiguously between success and failure. He creatively inserts what would otherwise be a standard documentary interview into his own stylistically-unique animated world. 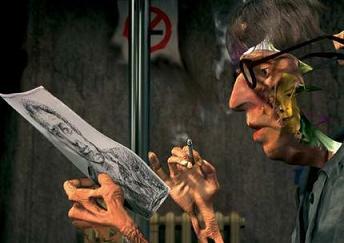 Ryan’s real-life appearance is reworked, and reinterpreted by these means, into what is at once a kind of caricature and a deeply “real” rendering. In other words, Landreth is hugely innovative tehcnically, stylistically, and thematically. He done good. One then asks: what is Green’s objective in revealing the details of the relationship between Landreth and Larkin in yet another film? Besides the natural curiosity that arises in seeing any “behind the scenes” documentary, I think Alter Egos is also driven by a desire to deconstruct issues of representation — namely, who holds the power of cinematic representation, and how does the exercising os such power weigh on the represented? Landreth’s film re-creates Ryan Larkin…indeed, when I hear the name, I picture Landreth’s skeletal animated portrait of him. Has Landreth succeeded in actually redefining Larkin’s identity? Can we only know him as the Ryan of Ryan? In investigating the context surrounding the making of Ryan, Green’s Alter Egos also shows us the complex “making of” Larkin’s public image itself, underscoring the ability of film (and filmmakers) to create and solidify meaning. In this case, Green is in some ways able to allow Larkin a new space to reclaim his identity. 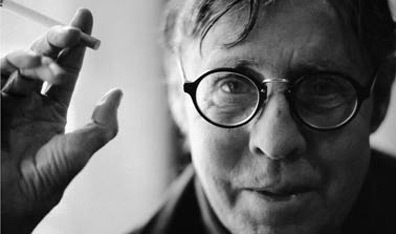 Ryan Larkin c.2004, Image for Green's "Alter Agos"
I would say that the “climax” of Alter Egos is the scene in which Larkin watches Landreth’s film for the first time. In case you haven’t seen it, I won’t give anything away, but the scene reminded me that the very notion that Larkin might not appreciate Landreth’s representation had never previously crossed my mind. I had, until then, easily accepted Larkin’s place in Canadian film history as “that coke-addict guy in that other guy’s trippy short film.” The scene is a kind of crossroads where the subject, author, past, present, reality and fiction of Ryan meet. Green gives us a context for Landreth’s film that had for so long been revered more so as an art object that a slice of an entire narrative. He makes audiences of himself, Landreth, and Larkin alike understand Ryan — and for that matter, other documentaries — as being only a part of a story, with both a historical lead-up and aftermath. Things to ponder, you ask? How does the documentary genre work to crystallize history for us? Does it simplify narratives, complicate them, or both? Do we lose something every time a documentary is made? What do we gain? Holler at your girls. This entry was posted in Uncategorized and tagged Chris Landreth, Laurence Green, NFB, Ryan Larkin. Bookmark the permalink.